This article is published in partnership with MojoReporter. Since implementing MojoReporter TEAM Edition across its seven local newsrooms last summer, the Kent Messenger Media Group has seen a dramatic improvement in the quantity and quality of its stories. 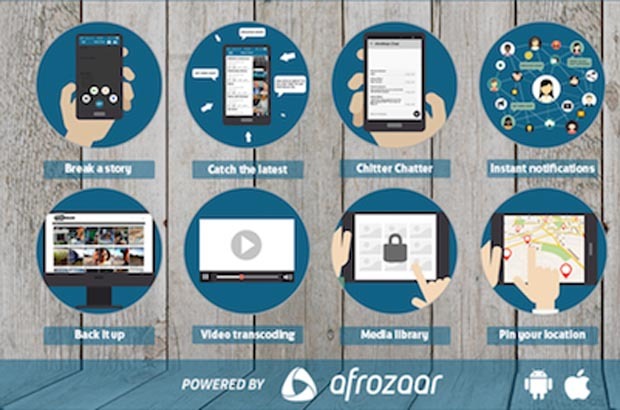 MojoReporter aims to provide media groups and mobile journalism (mojo) teams with their own private file sharing and collaboration workflow platform. “There are definitely stories being told now that wouldn’t have seen the light of day without it,” said KentOnline news editor Andy Richards. “Interviewees open up to reporters because all they see is a mobile phone, not a load of intimidating camera and recording equipment. Rich Cheary, chief executive officer of Afrozaar.com, the company behind MojoReporter, said the tool was created to help reporters feel part of a "private collaborative file sharing and communication ecosystem", where they have confidence that the newsroom will be notified as soon as a story is broken and that the central editorial team can efficiently find and reuse the video, photos, audio and GPS location media. The mobile content creation app has also helped grow traffic considerably, with around a million views per month across all the publishing and broadcasting channels. Previously, journalists who captured video content were all using different devices, uploading to different places, using varying codecs and resolutions. Communication between key players in the news production process was also an issue; there were several incidents where video editors were not being notified about good multimedia content and traffic-raising opportunities were being missed as a result, said Richards. MojoReporter has solved those problems by simplifying the mojo workflow process and making content available to whoever needs it within seconds – whether it's for the TV, newspapers, website, social media pages, video channels or radio station. It enables journalists to send secure packages containing video, audio, photos and GPS locations to multiple users for review, back up or publication. A simple phone app interface makes it easy for the reporter to type copy and headlines, attach multimedia content and send to selected destinations, all in a couple of taps. This ease of use, combined with its unobtrusive mobile interface, has also resulted in better stories, according to Richards. “One of our reporters recently did an interview with the mother of a murder victim,” he recalls. “The interviewee was unsure initially but when she met our reporter – who had nothing but a mobile phone with her – she felt more comfortable and was happy to talk. As well as providing a clearer newsgathering and publishing system, centralised content and vital archiving facilities, MojoReporter has made life easier for journalists and editors. Medway Messenger editor Matt Ramsden said reporters have embraced it and "see it as an easy-to-use tool which allows them to record and upload content in a matter of seconds". 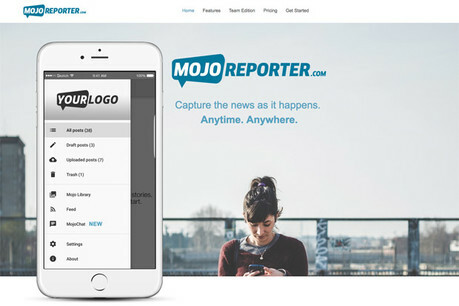 The MojoReporter platform is currently being used by a number of media groups, who have opted to integrate the mojo feeds into existing publishing and broadcasting processes, as well as leverage the added benefit of MojoReporter’s new UGC app module which has increased the amount of citizen reporting activities coming into the same web dashboard for review. “It’s almost been a year since we launched our beta version of MojoReporter, to be the first to market in providing a secure private mojo network for newsroom workflow and digital media archiving. We are very proud to have over 500 mobile journalists filing into a number of newsrooms on a daily basis”, said Cheary.